There are tantalizing hints about the book that Sebald was researching at the time of his death in a piece by Arthur Lubow in The Threepenny Review. This Berkeley-based literary magazine devoted much of its Spring 2002 issue to A Symposium on W.G. Sebald and I was just re-reading it for the first time since it arrived in the mail five years ago. Lubow recounts the time he spent interviewing Sebald for a profile intended for the New York Times Magazine. Unfortunately, Lubow explains, the profile was postponed by 9/11 and then turned into a much shorter article on Sebald – Preoccupied With Death, But still Funny – that was published on December 11, 2001 in the daily newspaper rather than the Sunday magazine. In rereading Lubow’s piece in The Threepenny Review, I was surprised to learn that he had conversed at length with Sebald about his projected next book (Austerlitz had just been published as they spoke).In a recent entry I talked about Campo Santo, a posthumously assembled book of Sebald’s writings which contained fragments from a book that Sebald apparently abandoned in the mid-1990s. In that entry I mentioned that Sven Meyer, the editor of Campo Santo, assured its readers that Sebald’s estate included “no other recent literary works.” But according to Lubow, there certainly should be extensive research material in Sebald’s archive. Lubow writes: “At the time of his death, Sebald was researching a book that would explore, among other subjects, his family history. ‘As they all came from the lower classes, there are often not even exact dates of birth or places of residence,’ he told me. ‘This uncertainty begins two generations back.’ His ancestors inhabited a forested region between Bavaria and Bohemia that had, from the time of the seventeenth century, been devoted to glassworks, and so Sebald could speculate with reasonable confidence about their working life. But even of that he was never quite certain. Like an archeologist reconstructing a pot from a couple of shards, he worked in a way that he characterized as ‘extremely tenuous and unreliable’.”Lubow goes on to disclose more about this book that will never be.Read the online excerpts of the Sebald symposium at The Threepenny Review, including Lubow’s article. By the way, Lubow is one of several contributors to a book due out in October 2007, The Emergence of Memory, edited by Lynne Sharon Schwartz. Here is what the publisher Seven Stories Press says about the book: “With contributions from poet, essayist, and translator Charles Simic, New Republic editor Ruth Franklin, Bookworm radio host Michael Silverblatt, and more, The Emergence of Memory offers Sebald’s own voice in interviews between 1997 up to a month before his death in 2001. 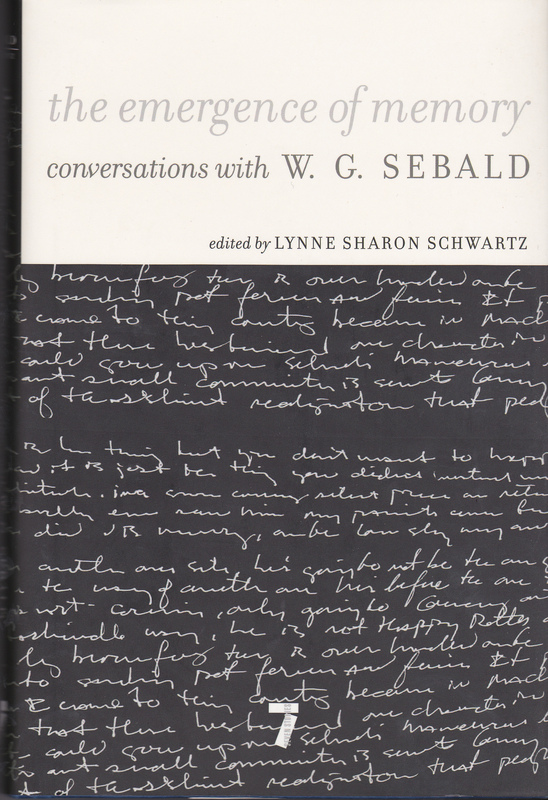 Also included are cogent accounts of almost all of Sebald’s books, thematically linked to events in the contributors’ own lives.Contributors include Carole Angier, Joseph Cuomo, Ruth Franklin, Michael Hofmann, Arthur Lubow, Tim Parks, Michael Silverblatt, Charles Simic, and Eleanor Wachtel.” The book can be pre-ordered at Amazon. It looks to me as if the cover of The Emergence of Memory (shown above) is from a painting by Katherine Jackson, who has done several works related to Sebald and whose work can be seen at Boston’s OH+T Gallery.